I have a particularly personal relationship with trees. I love to run my fingers over the whirls and eddies of tree bark, to close my eyes and place my hands on the complicated trunks while I think of nothing. The feeling I get from this is hard to describe, but there is a sense of being grounded in something larger than myself. This might come from the many years of growth encapsulated in the rough exterior. Or perhaps it comes from the knowledge that trees, so seemingly inconspicuous have given humans life since the beginning of time. Are in fact alive themselves. Are perhaps in this moment in communion with all living things. My fascination began with an observation from a participant in one of my very first mindfulness workshops. 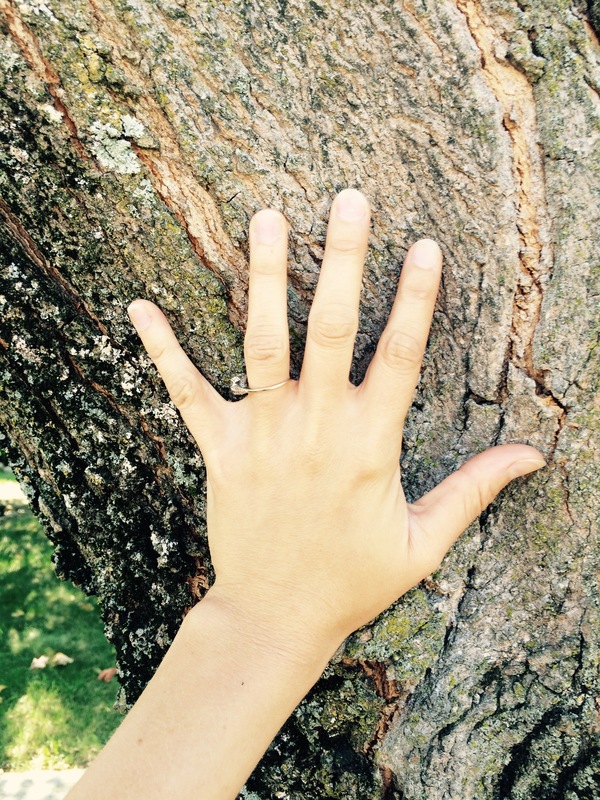 Someone shared how he had begun noticing the pattern of bark on the trees as he took his daily walks. His words echoed in my mind as I walked along a riverbank with my husband and our five-year-old son. I sat down on a fallen log, examining closely the moss-covered cracks and touching the peeling skin of the tree closest to me. “What are you telling that tree, Momma Mia?” my son questioned, calling me by my family epithet. “I’m telling the tree it’s beautiful,” I said after a moment’s thought. While I have pages and pages of research stating the varied, surprising, and interesting benefits of spending quiet and reflective time in nature, I will just say this: trust me. Please, find time to go outside today and touch a tree and think about what lives in that tree, and how that tree has served you as a member of the human species, and why we have all been given such a tremendous gift. Where have you most experienced the profound gifts of the natural world? How have these experiences shaped you? Please feel free to leave your comments here on send me an email via the “Contact” tab. Tagged: Alan Watts, Does tree hugging have health benefits?, ecotherapy, Forest bathing, Mindfulness in nature, Shinrin-yoku, The Center for Spirituality and Healing, Tree touching, What are the health benefits of spending time in nature?, What are the mental health benefits of being in forests?, What are ways to be mindful in nature?